Diamond bands are everything. Not only is the trend of stacking rings part of their excitement, but every woman wants one for everyday life. Tracy Jewelers knows all about what she wants. For almost 70 years they have been the authority in Spokane, WA. From custom pieces to the most coveted engagement rings, and all things in between, they’re the “jewelry snobs” you need when you’re on the hunt for what she wants. That’s why we are thrilled to call Tracy Jewelers of Spokane, WA our Coast Diamond Retailer of the Week. With the trend of stacking rings, you have a lot of choices in diamond bands. The classic diamond band is the most beloved year after year. It is the band that always compliments an engagement ring or it is the anchor that gives the most sparkle within a stack of rings. A Coast Diamond band is the perfect gift for an anniversary or birthday. It is an heirloom to pass down from generation to generation. Can you see why she wants a Coast Diamond band? Coast Diamond bands from the Allure Collection are the ideal classic diamond band. With a high-polished finish, these bands are available in (14K or 18K) white, yellow and rose gold or platinum. The most coveted Coast Diamond band (WS20000) is 1 full carat of round brilliant diamonds set in microprongs. This band is the perfect gift for your 10th Anniversary because it has 10 diamonds across the top. Without even trying, you’ve created a stack with this Coast Diamond band (WC20018) of round brilliant diamonds set in two rows with delicate microprongs. This band is gorgeous next to a fancy cut diamond solitaire engagement ring (like an oval, a pear or… the marquise is making a comeback). As the only Spokane AGS Accredited Gem Lab, Tracy Jewelers is where you want to find your fancy cut diamond. Thank you Tracy Jewelers of Spokane, WA for being passionate jewelry lovers, like, us, and congratulations on being our Coast Diamond Retailer of the Week! You are classy with a bit of sass. You love cowboy boots and stilettos. You look pretty even while you’re gettin’ ‘er done. You want an engagement ring that’s classic, maybe even heirloom, and of course, it has to sparkle in every direction. You’re a Texas girl! And if you’re ready to find your dream engagement ring you’ll find it at Beard Fine Jewelers in Lufkin. Beard is known for its fabulous selection of fine jewelry and loved for its excellent customer service. They enjoy sharing their wealth of knowledge with couples shopping for the perfect engagement ring or wedding band. We are thrilled to call Beard Fine Jewelers of Lufkin, TX our Coast Diamond Retailer of the Week! Beard Fine Jewelers is known for their generous giveaways. Cathy was their first winner for 2019. Look at that smile! Like and follow their Facebook page for updates on their special giveaways. 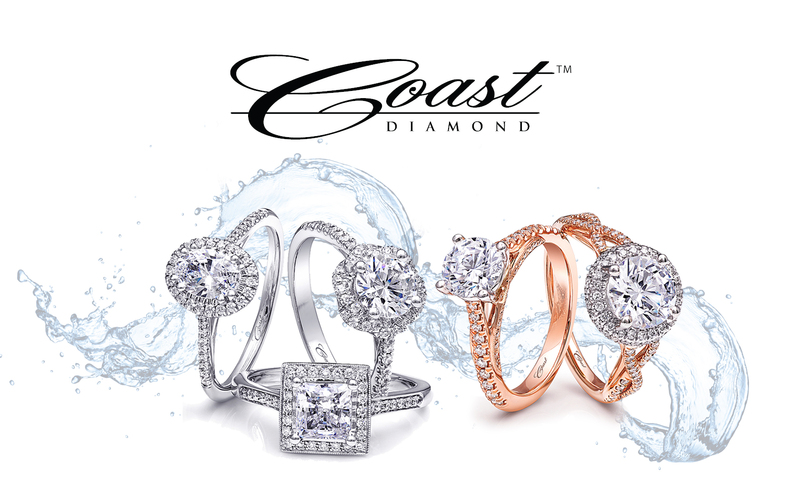 Coast Diamond has the mission of creating fine jewelry that is stylish and impeccably crafted. Our rings are of heirloom quality and so our rings are the perfect choice for the Texas bride. This Coast Diamond engagement ring (LC6101) and the matching wedding band (WC6101) is a dream! Scallops of diamonds decorate both rings and glitter and shine in all directions. The diamond center stone of your choice, from 0.25 CT to 5 CT, creates a ring just perfect for the Texas bride. Texas brides are fabulously stylish and that’s why this Coast Diamond halo engagement ring (LC5410-OV) customized with an oval diamond center stone is such a lovely choice. Of course, you can never have enough sparkle so we added diamonds down the shoulders of the ring. A pavé set sapphire and diamond ring says “heirloom.” This Coast Diamond ring (WC7040-S) is meant to say and feel like forever when it’s worn. Whether worn alone, with your engagement ring, or in a stack of rings, this is a standout ring, just like you. We hope you’ll visit Beard Fine Jewelers to see these and more Coast Diamond rings today! Find them on the corner of Medford Dr. and 1st St. in Lufkin. Congratulations to Beard Fine Jewelers of Lufkin, TX for being our Coast Diamond Featured Retailer of the Week!